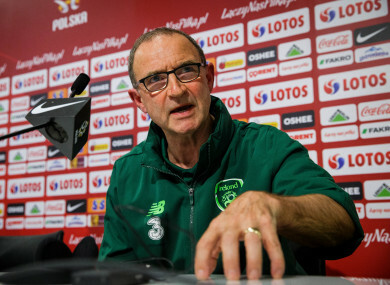 Ireland manager Martin O'Neill during Monday's press conference in Wrocław. MARTIN O’NEILL has described the contents of a leaked WhatsApp audio message as “an absolute side-show”, while claiming responsibility for any criticism aimed at his players or management team. On Monday morning, a voice message surfaced on social media detailing Roy Keane’s fall-outs with Jon Walters and Harry Arter prior to the summer friendly against France. At this evening’s pre-match press conference ahead of the friendly game with Poland, the Ireland boss confirmed the voice in question as Burnley full-back Stephen Ward, who was absent from that trip to Paris. Having faced Wales in Thursday’s defeat, the 33-year-old has since returned to his club with a foot injury. “First of all, I don’t think Stephen [Ward] was there,” said O’Neill. “Stephen wasn’t actually there. I think he’s just picking up on things, something that we talked about at the beginning of the week. “There’s probably not anything more to really report. I think that differences of what was said, I think I said that to you before [there was a] confrontation obviously with Jon [Walters] and a confrontation with Harry [Arter]. "I wasn't there myself. Stephen certainly wasn't." Martin O'Neill discussed that Whatsapp audio message during today's Press Conference. Speaking ahead of tomorrow evening’s match in Wroclaw alongside midfielder David Meyler, the Ireland manager explained that such confrontations were not out of the ordinary. I think these things are important to say, first of all the incident took place at the end of May when we were in camp,” he added. “So they have surfaced now, some four months later. “It wouldn’t be the first altercation between players and staff. I’ve had one with the man sitting beside me here [Meyler] just days ago, on Friday. O’Neill stated that he would take full responsibility for any criticism aimed at his players, and went on to back assistant Keane. “In my time as a club manager, I’ve chosen two brilliant, brilliant assistant managers — John Robertson and the young man himself, Roy Keane. “I’ve chosen them particularly and at the end of it all, none of them have ever let me down. I’ll take the responsibility for it at the end of the day, because that’s my job. When asked if the incidents had distracted from matters on the field of play, O’Neill said: “Absolute side-show. You say we have problems on the pitch, of course we have problems on the pitch. “We’ve got a number of players injured. We have lost two competitive games on the trot in a period of 10 or 12 months. The previous 11 competitive games in the World Cup, we lost one. Email “'It's not the first altercation between players and staff' - O'Neill responds to leaked WhatsApp audio”. Feedback on “'It's not the first altercation between players and staff' - O'Neill responds to leaked WhatsApp audio”.